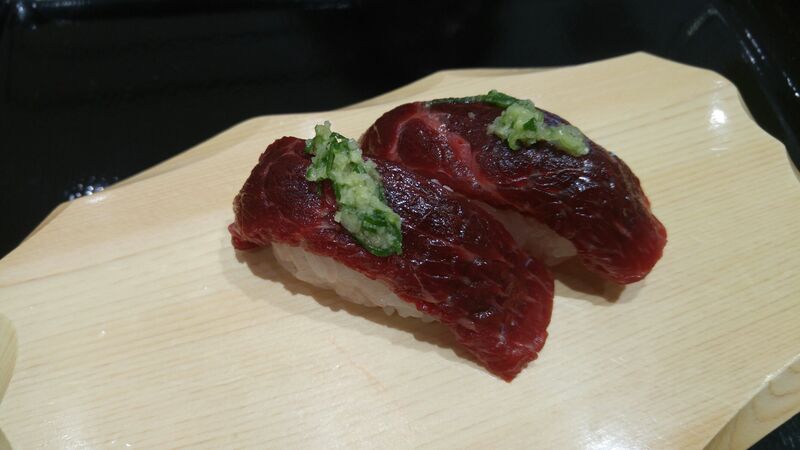 Fujieda City, Shizuoka Prefecture, sushi, Sushi restaurants. 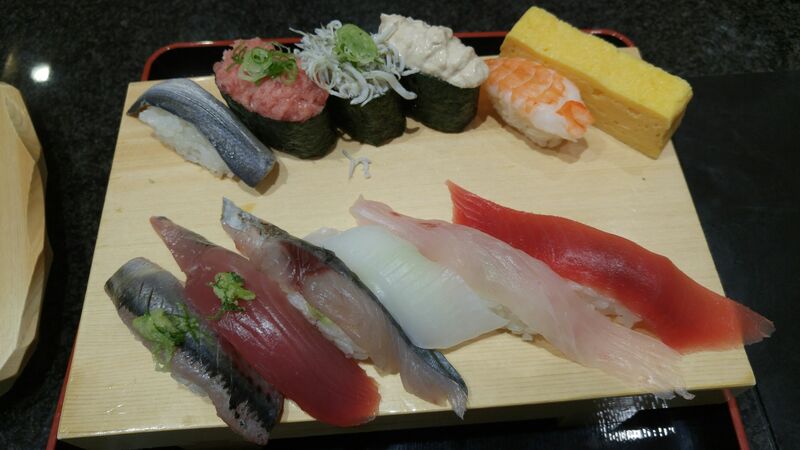 Sushi Lunch at Uogashi Nagarezushi in Fujieda City! 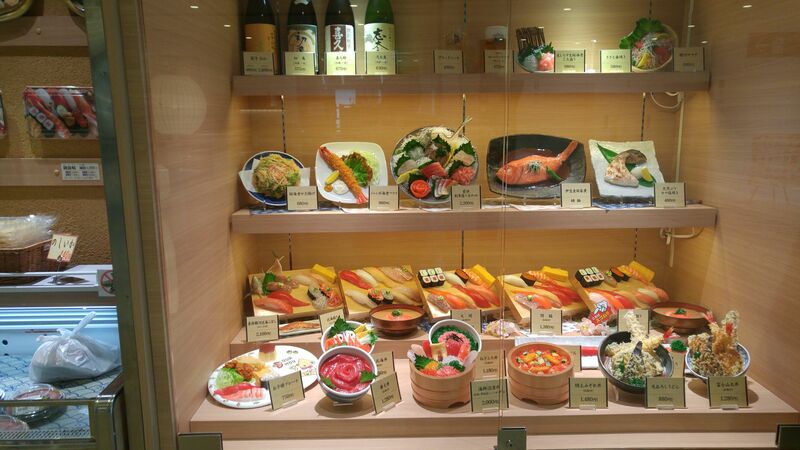 If you are in a bit of a hurry but still are hungry Fujieda Station is a practical place to enjoy some reasonably-priced but still tasty sushi. 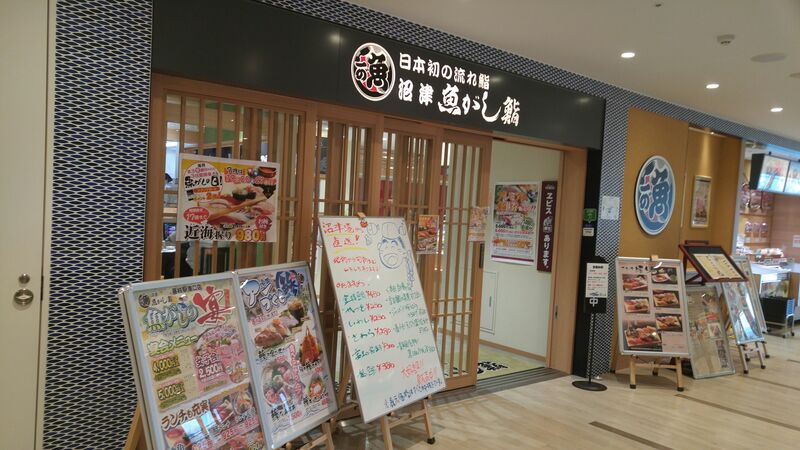 Uogashi Nagarezushi is located on the second floor of OLE Building just beside Fujieda Station south exit! It is a fairly big place but seats are sufficiently separated for necessary privacy. This is a “nagaraezushi”, that is a system where orders are coming to your table via a computer service. Very quick and efficient and the staff will come regularly to collect away your empty plates. 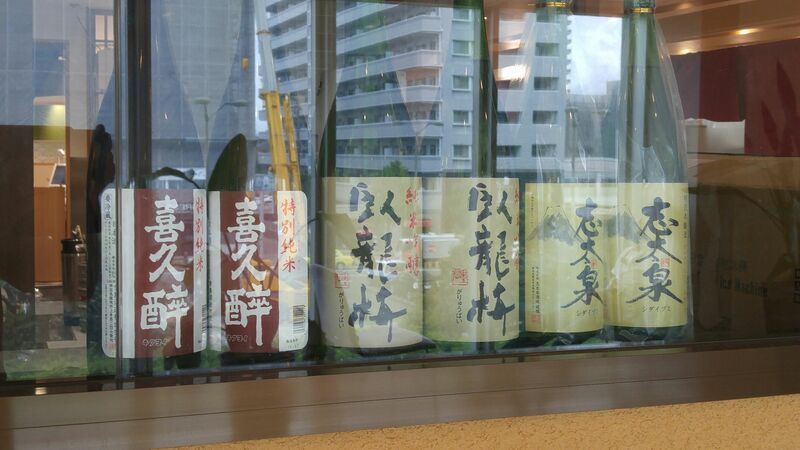 Plenty of top-class local sake! What did we have, then? 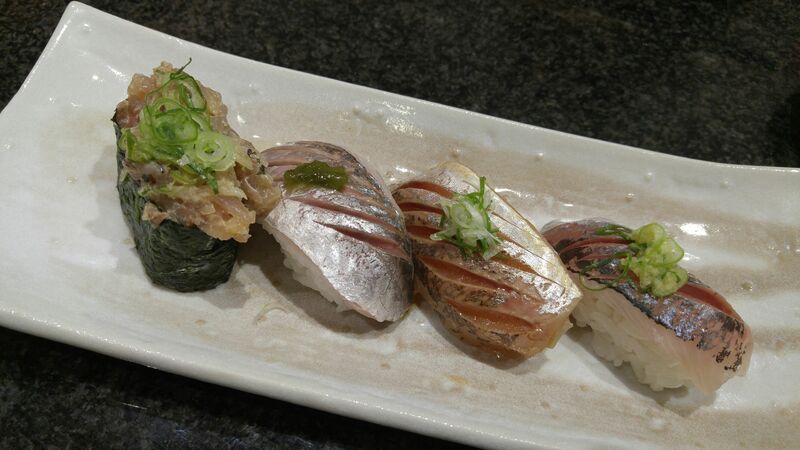 A set consisting of horse mackerel/aji/鯵 prepared in four different manners! 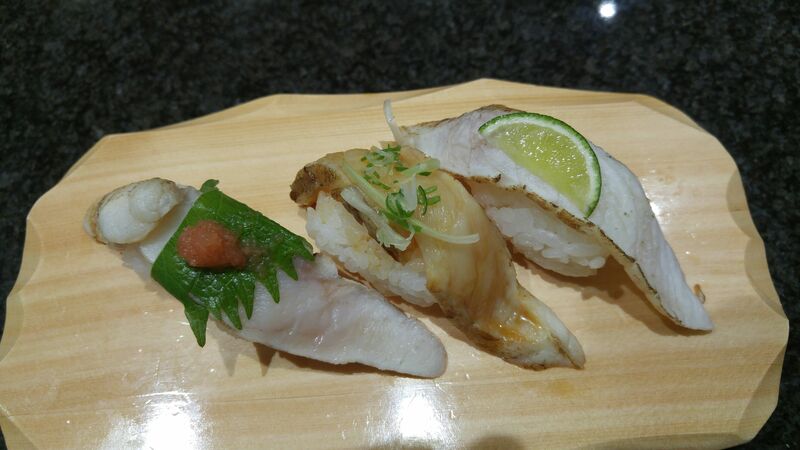 A set of three white-flesh fish/shiromi/白身 in aburi/seared/炙り style! A mixed set of twelve diffrenet sushi nigiri! Gizzard/kohada/小肌, grated tuna/negitoro/ネギトロ, boiled sardine whiting/shirasu/白子, crab salad/kani sarada/蟹サラダ, boiled prawn/yudeebi/茹で海老, Japanese omelet/tamagoyaki/卵焼き, Horse mackerel/aji/鯵, bonito/katsuo/鰹, mackerel/saba/鯖, cuttlefish (squid9/ika/烏賊, seabream/tai/鯛, and tuna red lean part/maguro akami/鮪赤身! 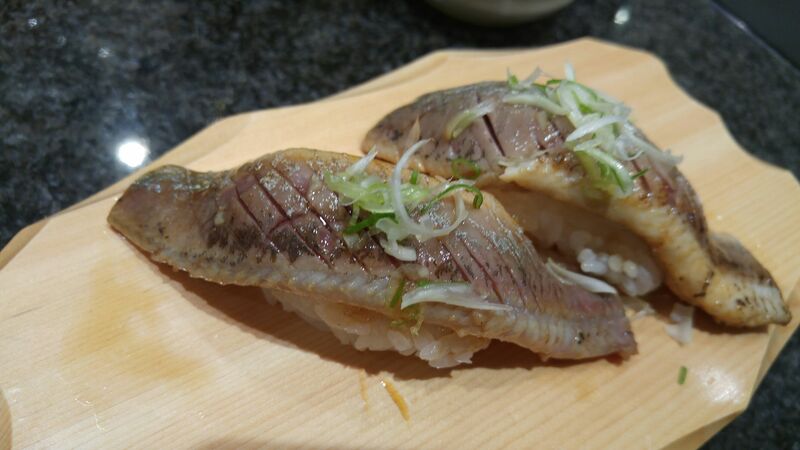 Large horse mackere/aji/鯵 in aburi/seared/炙り style! 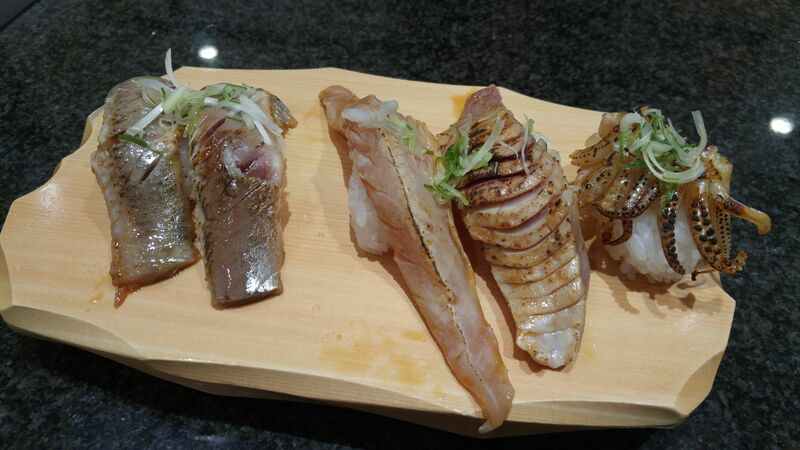 And to finish, another set of nigiri in aburi/seared/炙りstyle: horse mackerel/aji/鯵, tuna/maguro/鮪　and cuttlefish tentacles/ika geso/烏賊ゲソ! All with as much tea and pickled ginger as you want!